It’s always such a pleasure to revisit a website I have designed for an artist to see that they are managing to update it themselves! I just popped in to a site I created for Ruth Thomas at the end of last year: ruththomasart.co.uk. It’s one of my favourite web designs actually. 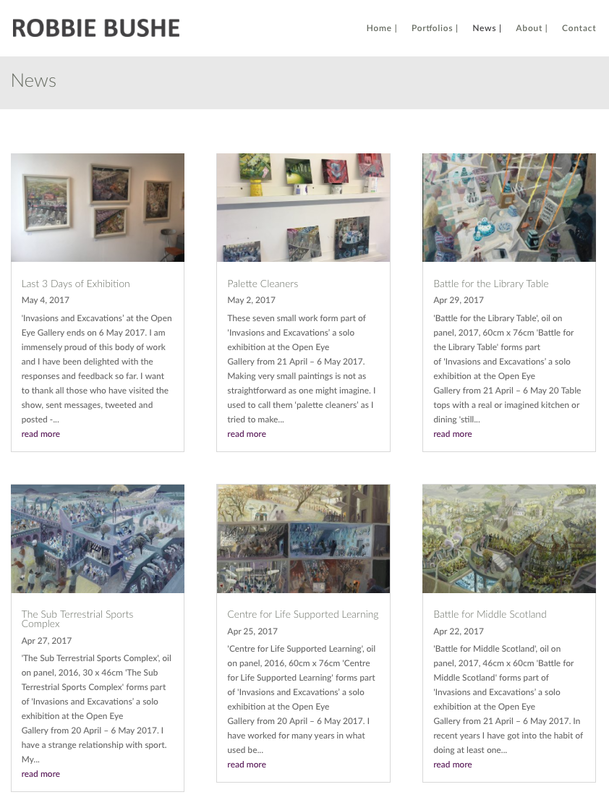 I think it works really well on desktop, tablet and smartphone, and complements her art work well with the grids presenting her complex works in an orderly fashion. I was delighted to see that, since the launch of her website and the training I provided (help sheets and training videos), Ruth has successfully added 11 News posts unaided. Good work Ruth!!! Robbie Bushe (www.robbiebushe.com) and his partner Catharine Davison (catharinedavison.uk) are two other clients who have really taken the website’s I have created for them (a matching pair!) and run with them. They are now confident to upload new artworks to their Portfolios and post regular news items. Would you also like a professionally designed website that you can update yourself?